Cube Cities Blog: Cube Cities Direct Link: "View it in Cube Cities"
Use our new "View it in Cube Cities" button to link to buildings and available space on Cube Cities. Click the icon to open the Empire State Building. To find the link for any listing, click here to locate the listing in Cube Cities, and then copy the URL after the listing has been selected. 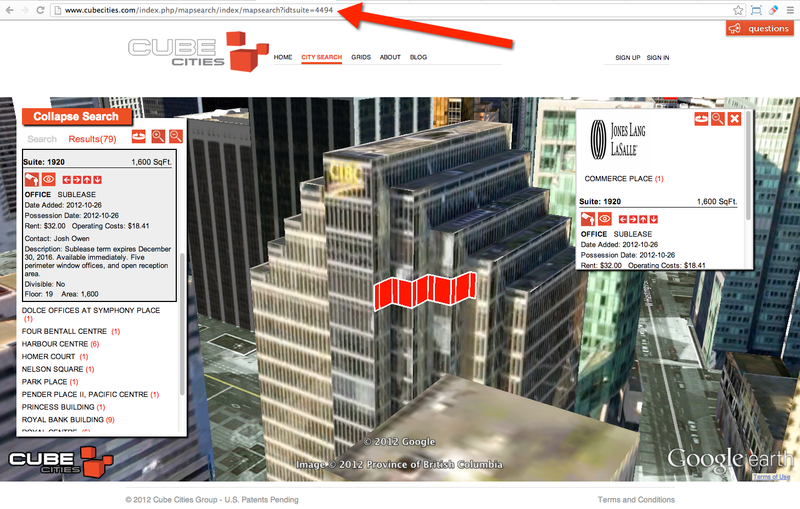 Below is an example of an office listing in Vancouver and the arrow indicates the URL that points to it. Cube Cities embeds the precise camera view for the listing in the URL so brokers and property managers can be sure their listings are viewed exactly as planned.